Same im used to be play with this mod for a year or more cant make it work now. Very pretty, but I immediately crashed to desktop regardless of the load order. Uninstalling. Edit: Fixed it by reloading a save from before I installed the mod. Pity I made it about six hours before I figured I didn't like this mod as much. How do I get Aela to wear the armor you have in the 4th image you posted. for some reason I always get her wearing the leather armor even though i installed with the normal one? You can easily delete the old information which is stored in your savegame with the "Save game script cleaner". Load the savegame with the tool. Search for the box "formId", enter her Base ID (0001A696) and press delete. Save and you're done. I'm glad I stumbled over this mod, I'd just recently upgraded Vilkas and Farkas' looks and Aela needed some lovin'. I can't get this to work at all, no matter which version I try. 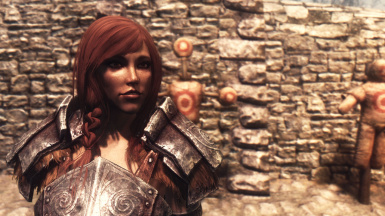 I have both ApachiiSkyHair 1.5 and ApachiiSkyHairFemale 1.3 installed and when using either the Draugr armour or the leather armour version, Aela is still as she appears in vanilla although with dark red skin from the neck up. Using the creation kit to attempt to 'fix' the dark face bug doesn't work as it says the file has too many masters. Starting a brand new game on a fresh Skyrim install v1.9 with only this mod and the required and supported UNP mods enabled produces the same result. 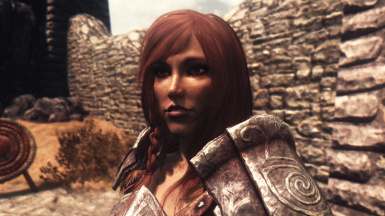 I have manually installed many mods without any problems before but I attempted to use NMM to install this just in case and NMM (0.52.3) won't install it, claiming that there is a problem with the file this mod places in the Data\meshes\actors\character\facegendata\facegeom\skyrim.esm folder. Any other mod I have which uses files from ApachiiSkyHair and/or UNP works fine. Hi, I installed the mod with ApachiiSkyHair and stuff, and It still not working for me, do you have an idea why ? Nope I drag all the files in Data and my Skyrim work only when I disable your mod. Really really like this mod. Best one out there for this particular NPC.